Berlin, Hong Kong, Utah, Toronto, Cannes and Venice all play hosts to major film festivals throughout the year, although Italy is said to be the most glamorous event on the showbiz calendar. For one week in September, the tranquil Lido island lagoon is given a burst of Hollywood life when the who's who of celebs, directors and VIP’s flock to the festival. Onlookers crowd to the edges of the red carpet in hopes to catch a glimpse of their favourite celebrities, and, of course to see what everyone is wearing! This year, at the 74th Venice International Film Festival, in front of the main building, the Palazzo del Cinema, you really see a little bit of everything. Anything seems to go at these festivals, but the high end Hollywood glam game is definitely strong! This year we saw supermodel Isla Goulart sporting a more casual, yet super sassy sheer miniskirt with an Alberto Ferretti Days of The Week sweater and Giuseppe Zanotti strappy heels. Amal Clooney, who never disappoints, effortlessly wore a floor-sweeping lavender Atelier Versace design where the skirt was dyed in shades of pink and lilac underneath for photographers to capture as she walked, and lastly, accompanied with drop gemstone earrings by Lorraine Schwartz. Attendees exhibited a range of some exquisitely textured outfits. We saw looks from sequins, to lace, to sheer cut-outs and celebs like Rebecca Hall totally owning the red carpet in a Giorgio Armani Prive Couture fall 2017 collection sheer, beaded dress that looked like fireworks on the fourth of July! To get more of your celebrity fill, the historical Hotel Excelsior Venice Lido Resort, built in 1908, is a celeb hot spot during the festival, and has always been the destination for the rich and famous. To complete your Venice visit there are a few must-see spots and activities. 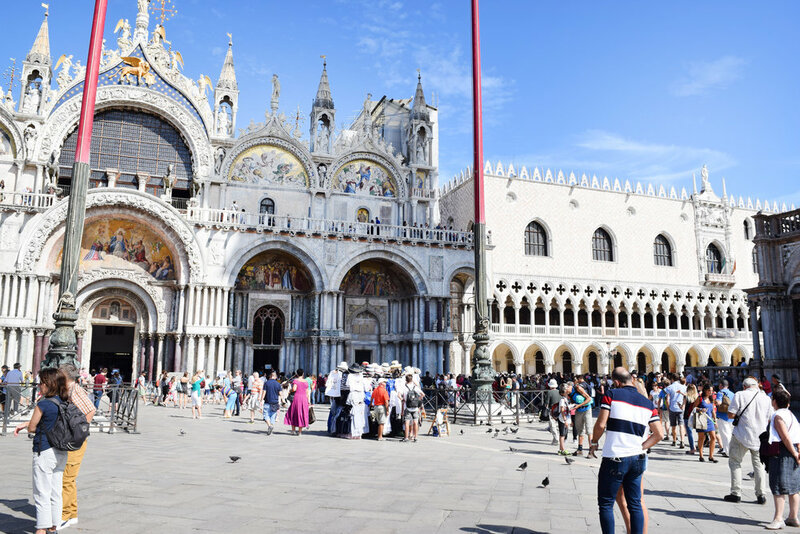 Take a walk through Piazza San Marco, see the famous Basilica di San Marco, order some incomparable gelato and have a cappuccino at one of their many outdoor cafe’s facing the water or the Palazzo Ducale (Doge’s Palace). Be sure to take a Gondola ride through the Grande Canal to see the famous Rialto Bridge. Gondola rides range from 80€-200€ depending where they take you, but be sure to negotiate with your Gondolier! Travel like a celebrity and pre-book a relaxing water-taxi from the Marco Polo airport to take you to your hotel. You’ll feel like Angelina Jolie and Johhny Depp in The Tourist upon arrival and the hotels bellman reach out to help you out of the boat. A relaxing trip is definitely a trip to remember! So, if you make it to Venice during festival time, you’ll be sure to make some fabulous memories, and capture stunning photos to show off to all your friends!